April Fools may be a day for harmless pranks, but Time and Telekom Malaysia had other things in mind. What started as good natured joking quickly ended with less than friendly references to broadband coverage and the using of taxpayers money. The incident started with Time congratulating TM on its new 100Mbps Unifi Pro plans which was announced shortly after Time had revealed its own highspeed broadband packages. TM replied with a comment about Time’s lack coverage in the country. 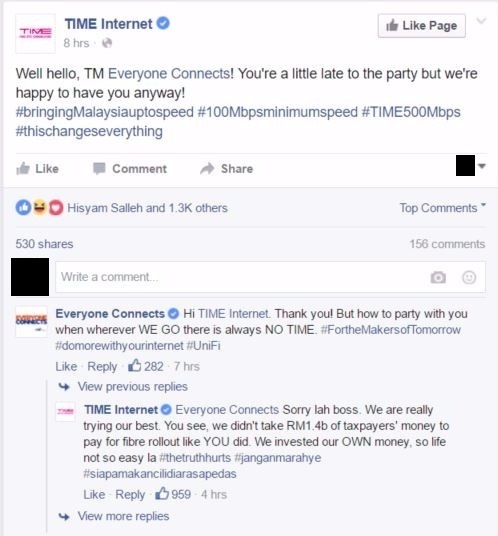 Time naturally replied with a jab at how TM funded its fibre optic network, and the conversation devolved from there. Admittedly, there was the potential for both companies to walk away from the conversation on friendly terms and keeping customers from both sides happy. A situation that happens every so often when the social media managers of brands trade jabs in public and end the conversation on a friendly tone. Friendly rivalries are becoming more common in the age of social media, but conversation between Time and TM had anything but an amicable undertone.